Recently I was one of the few chefs who was talked about it in the article by Mid-day regarding baking Christmas goodies. They wanted something revolving around Gingerbread and hence I told them about Gingerbread Doughnuts. While we were talking about Gingerbread, a very good question was asked and that was – What makes the dish – Gingerbread. I realized the concept was very simple – to anything if you add ginger powder, cinnamon, nutmeg and all spice. Replace the castor sugar with brown sugar to add in a little bit of nutty flavor. And oh! you have a gingerbread dessert. It is pretty simple. Honey or molasses is also added to enhance the flavor. I absolutely love anything Gingerbread, cause I love spiced up dishes. Gingerbread somehow brings out a different taste altogether. 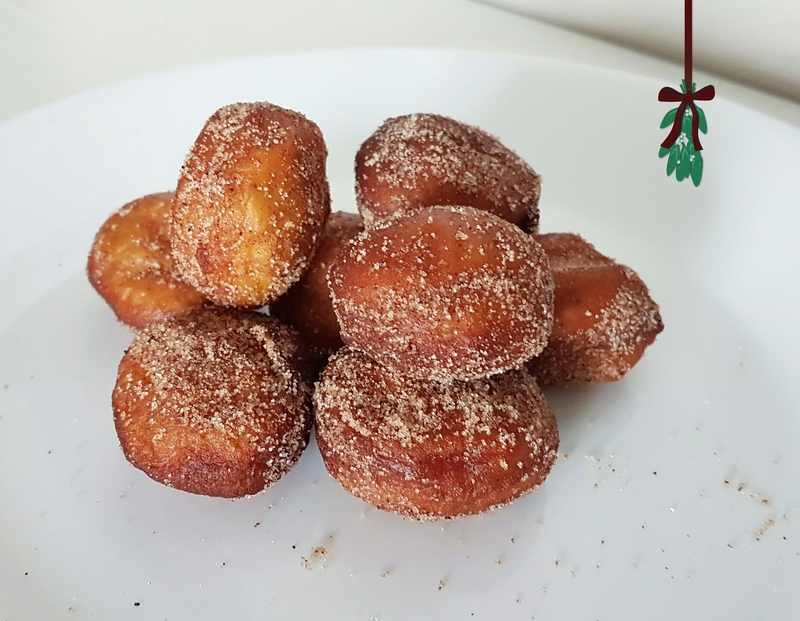 This year, I thought lets change things a bit and not bake the regular cookies that I make and go for Gingerbread Doughnuts. They are very easy and takes a little bit of time, as I am doing yeast – leavened doughnuts. But other than that they are a perfect treat for this festive season. In a stand mixer bowl – take the warm water, add 1 tablespoon of sugar and the yeast and mix until the yeast is dissolved. Keep it aside for 5 – 7 minutes. Meanwhile in a bowl mix – flour, both the sugars, baking powder, salt, ginger powder, cinnamon, nutmeg and all spice. When the yeast is active, it will become foamy, add the yolks, butter, and vanilla. Mix with the paddle attachment for 1 minute. Keeping the speed on low, keep adding the flour with a big spoon. After adding half of the flour, shift to hook/dough attachment and add the remaining flour. Mix for 3 – 5 minutes on medium high. Cover the bowl and let the dough rest for 1 hour or until it doubles in size. After 1 hour, knead the dough and roll it to an 1/2 inch thick height. If you want small bite size pieces, cut them with 1 inch round cookie cutter. If you want the original doughnut shape – cut it with one 3 inch cookie cutter and then 1 inch cookie cutter to cut the centers. If you have a doughnut cutter, then you know what to do. You can re – roll the remaining dough and cut them. Let the doughnuts rise for 45 minutes to 1 hour. In a frying pan, heat the oil till its 180 C. Fry the doughnuts for 30 – 45 seconds on each side or until brown. After removing, let them sit for 2 minutes on tissue papers and then coat them in cinnamon sugar. You can add / delete the amount of spices in the dough according to your taste. If you don’t like too much cinnamon in your dessert avoid the coating of cinnamon sugar and just coat them in plain sugar.